« Why did we invent pottery? Nurturing of the trees has been maintained even in periods of climate change, during which the trees have not adapted with predictability, Gallagher said. 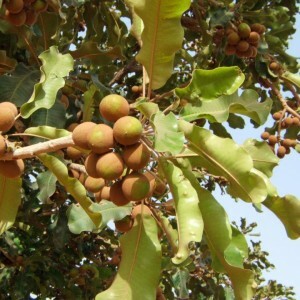 Other agricultural practices, such as millet and sorghum production that is common now, have been managed around where the wild shea trees grow. Such practices suggest that a form of sustainable farming has been in place for hundreds of years, she said. “In the layers, we’ve found exterior shells that have been knocked off the nuts. When a household first starts using shea, nutshells are all over the place,” she said. “Some are thick. Some are thin. There is a huge range of variability. As households become established the shells become more consistent and thinner. This is reflecting that trees are being brought into these cultivation systems.